I was a super slob. Not only was my house a messy disaster, but it was also hella dirty. When I did attempt to “clean” my home, I spent the entire time “tidying” instead. I just had so much stuff…everywhere. After hours of putting things away and trying to find places to shove things that didn’t have an away to go, I was just too tired to actually wipe or scrub anything. It was organization that transformed my home. Taking the time to make actual homes for all of my belongings, and ensure that those homes were super easy to access, that was the key for me. That wasn’t the whole picture though. In order to maintain a clean home, I had to do a little tidying and wiping each and everyday. Enter my bedtime routine. 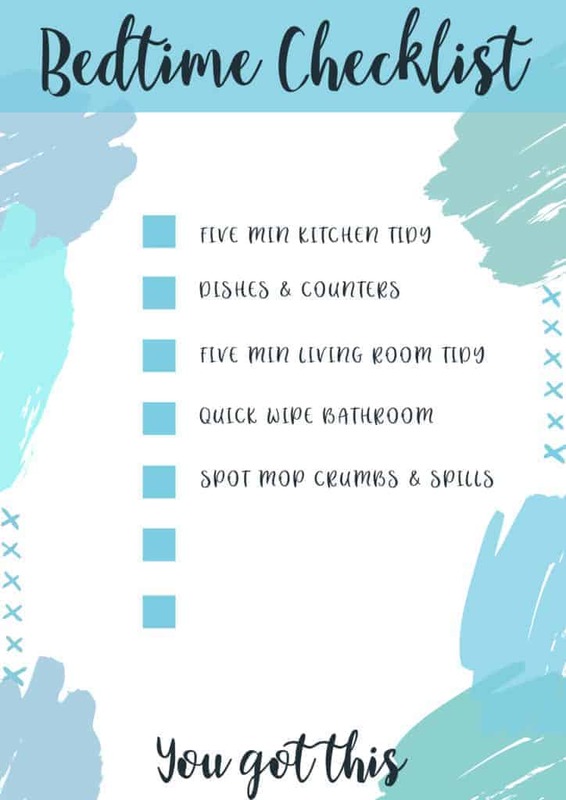 This simple, 20 minute routine is the reason I have a perpetually clean home. It’s the reason I can keep up on housework and the reason things never get overwhelming. This routine will change your life! If you have resisted routines in the past, I get it. Routines felt rigid to me…like somehow if I had a written routine I was conforming to “the man”. Let me tell you, as someone who resists structure, routines are not conformity: Routines are maturity. This bedtime routine will make your life easier. You will be happier. You will finally feel like you have your crap together…and it only takes 20 minutes a day. TRY IT!! Download this Bedtime Routine now and force yourself to try it every single night. I left two blank spots so you can add in extra chores if you like! So, put on your grown up pants and commit to 20 minutes every night! You got this! Hide your computer cables using an eaves trough! January Calendars…better late than never! Do you have Invisible Clutter?